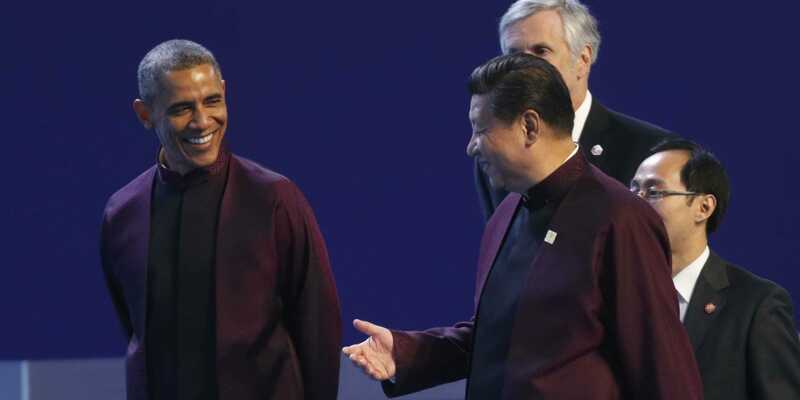 Kim Kyung-Hoon/ReutersUS President Barack Obama, left, with China’s President Xi Jinping during the Asia Pacific Economic Cooperation forum, at the International Convention Center at Yanqi Lake in Beijing on Tuesday. China and the United States have reached a breakthrough in talks on eliminating duties on information technology products, a deal that could pave the way for the first major tariff-cutting agreement at the World Trade Organisation in 17 years. The breakthrough would allow the “swift conclusion” on talks to expand the Information Technology Agreement (ITA) at the WTO in Geneva later this year, United States Trade Representative Michael Froman told reporters on Tuesday. It would reduce global tariffs on such products as medical equipment, GPS devices, video game consoles, and next-generation semiconductors. “This is encouraging news for the US-China relationship,” Froman said on the sidelines of meetings of the Asia-Pacific Economic Summit (APEC) in Beijing. The ITA, which went into effect in 1997, now covers more than $US4 trillion in annual trade, according to the US government. Participants to ITA commit to eliminating tariffs on such items as computers and computer software, telecommunication equipment, and other advanced technology products. An expanded ITA would eliminate tariffs on about $US1 trillion worth of global sales on IT products, Froman said. More than 200 tariff lines will be reduced to zero under the new agreement. US Chamber of Commerce Executive Vice President Myron Brilliant immediately welcomed the announcement. REUTERS/Kevin LamarqueUS President Barack Obama and Chinese President Xi Jinping arrive for the APEC Summit ‘family photo’ in Beijing on Monday. Talks to update the WTO pact on technology trade broke down due in summer 2013 because of disagreements over the scope of coverage of what listed products would be covered by the agreement, Froman said. 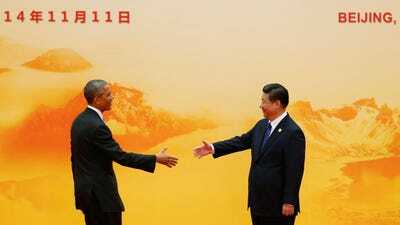 “Since that time, the United States and China have been working to close our differences,” Froman said. The United States and other countries were hopeful that China would agree to an expanded ITA agreement, which requires signatories to eliminate duties on some IT products, during the APEC summit ending Tuesday. Washington has blamed China, the world’s biggest exporter of IT products, for derailing the talks by asking for too many exemptions. “While we don’t take anything for granted, we’re hopeful that we’ll be able to work quickly to bring ITA to a successful conclusion,” Froman said.